This room sums up my style perfectly. It’s luxe but with a bit of an edge. I love the colours – charcoal, blush pink with flashes of brass and greenery. It’s a little bit different while still being comfortable and cool. Kate Watson Smyth, interiors journalist and style blogger, creates a fabulously edgy Urban Glamour look using fabrics from our stunning new collections of curtains and Roman blinds. 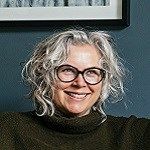 Kate Watson-Smyth is an interiors writer and journalist whose award-winning blog ‘Mad About the House’ is the number one interiors blog in the UK. Kate describes her style as ‘Urban Glam’ which she defines as: ‘a fairly monochrome palette with luxurious textiles and a few muted colours added’. We love the fine line that Kate walks between glamour and grunge, elegance and anarchy, and so we asked her to show us how to pull off this delicate balancing act, using fabrics from our new collection of curtains and Roman blinds. We were intrigued to know which fabrics would catch Kate’s discerning eye and she immediately picked out Clarence Chemise - a shimmering faux-silk fabric in a delicate blush hue. This was the starting point for the whole scheme. Kate told us: ‘Once I had the concept of the pink blinds and black windows it was easy to build from there’. Kate complemented her pink Roman blinds with cushion covers in Harran Black , Tetbury Blush and Tetbury Black . Create a fabulous Urban Glamour look in your home. We share the key design elements of this classic look to help you design your own unique take on this edgy and cool trend. Give your home a touch of Urban Glamour with fabulous curtains & Roman blinds from our new collection. Browse our inspirational interiors to find cool looks for your home. Discover more about interiors journalist Kate Watson-Smyth. In this interview we chat about her design inspiration and approach. Plus she shares her top tips for designing with Roman blinds. During your in-home appointment, an expert advisor will bring our entire range of fabrics for you to browse in comfort. We can help you finish your window dressings with a choice of linings, including blackout and thermal options, as well as advising you on different header types, curtain tracks and poles. Using our clever visualisation tool, we can even show you exactly how different colours, patterns and prints will look in your very own window. Once you’ve settled on the perfect fabric, we’ll measure your windows and, when we receive your order, return to fit your beautiful made-to-measure window dressings. So all you need to do is sit back and enjoy your fabulous new look.